I don't know about you but I'm getting sick and tired of seeing protest and whining every dern time I turn on the TV or log into social media. I always wonder if it solves anything. I feel like rather than it being free speech or whatever, I think its more as threatening. "If your going to do that, then we will do this" kind of thing. I see no problem when people walk around with their signs letting the world know their opinion, but when protesters start blocking traffic or burning down the town, that's just plain out rioting which I feel should be illegal. Why can't these protesters just write a simple letter to express their concern or arrange a meeting? Whats the point in making yourself out to look like an idiot? I admit, I was sort of nervous about the groundhog's decision yesterday. I mean, I was pretty upset too about his decision that there will be 6 more weeks of Winter. But you know what? Look at your calander. There is 6 more weeks til the first day of spring anyway, so I think he was right on this one. Not everyone is going to agree with everything. That would just be weird but to act like they are acting? 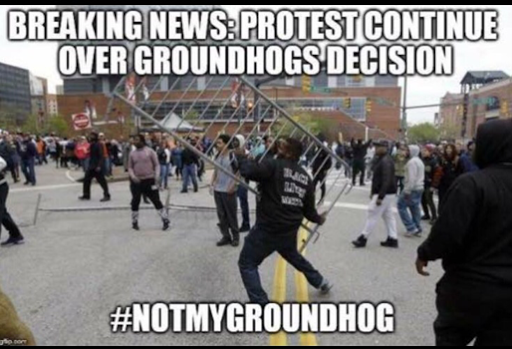 And to find every reason to protest? It seems like its all a game to them and a reason to act out. It's not solving anything. I have never seen so many people upset over the President. He needs our prayers. He needs to be given a chance to do what he thinks is best for America. The angry people in this world are just fueling the fire. I see many people degradeing America. We need peace. We need love, but for heaven sake! You sure ain't showing any! I've gotten to the point I fast forward quickly over those news segments. Ah. I feel much better. And I've unfollowed almost two hundred people on FB due to their vitriol. Ah. Double goodness. I am truly amazed that the liberal community, (the group that respects EVERYONE's rights down to dogs, cats, and whales are intolerant and burn another citizen's buildings and cars? Who woulda thunk it? A lot has been done in the past 8 years that DID NOT suit my fancy, but I felt no need to threaten, shoot or loot. I have to agree. I consider damaging property under the pretense of protesting to be a crime. 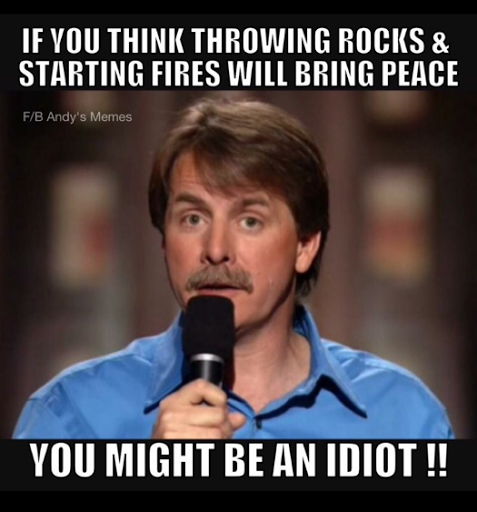 Throwing rocks and burning other peoples property becomes Rioting, not protesting. It doesn't matter what side you are on, it's just common sense. Where is the law and order? 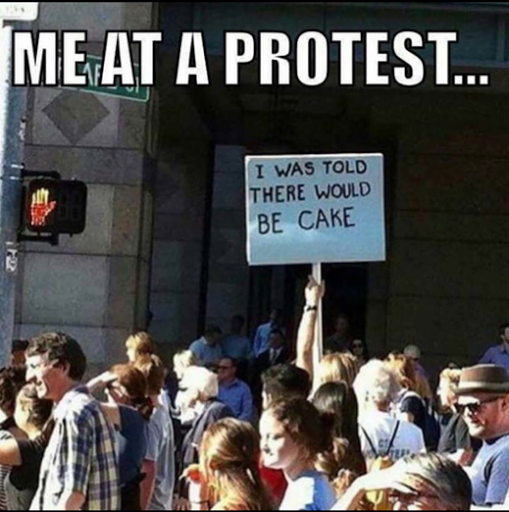 I don't watch television so don't see all the protesters : ) but I agree with you. I walk a mile in 15 minutes! I think it beats walking on a treadmill. Throwing a brick has NEVER solved a problem!! I think like the Occupy Wall Street movement, while the message is good these crowds attract some of the wackiest weirdos who crawled out of some rock and cause a very bad reputation. But I'm always curious on how police egg things on at these events. A few days ago saw a video of a woman being peppered sprayed severely and she was handicapped along with the people that tried to shield her. Got to imagine the folks on the sidewalk aren't very happy about getting peppered sprayed and tear gassed especially without just cause. Protesting and rioting are two separate things. Like Fishducky, throwing a bricks and burning is not the answer. But if we proclaim to be a free country then we have to respect the rights of those with differering points of view. I'd be willing to bet if the Russians had helped Hillary win the election instead of Trump, the other side would have been protesting. Just my thoughts.